My introduction to L.J. Smith started with her Forbidden Game Series – a trilogy which immediately hooked me in and forced me to fall in love with it – so color me surprised to find another one of her trilogies, Dark Visions, to be strangely lacking in comparison. Perhaps it’s not fair for me to notice these egregiously obvious differences not only in the writing style, but in the character development as well, but I was disappointed. Kaitlyn Fairchild has always been different from other girls around her, but it is her haunting eyes and prophetic drawings which cause her to become an outcast in society. When she is given the opportunity to learn more about her mysterious powers and finish out high school in California, she cannot resist. Kaitlyn and four other teens – Anna, Gabriel, Rob, and Lewis – all possess some type of psychic power and are submitted to daily tests to see the limitations and growth of their powers. However, not all is as it seems at the Institute and Kaitlyn and her new friends may unknowingly find themselves in grave peril. For some reason, Dark Visions constantly reminded me of Kelly Armstrong’s The Darkest Powers Trilogy. In both, the first novel serves as a set up for the upcoming series as the protagonist meets other people who possess similar powers as her. However, where The Darkest Powers cast a strong heroine, interesting romance, and complicated friendships, Dark Visions failed to do that. Kaitlyn is a likeable protagonist, but she lacks human flaws. Furthermore, her friendship with Anna, Lewis, and Rob seemed a little too easily made and failed to have any type of depth to it. Her romance with Rob originally comes across as being unrequited and silly for she thinks she is in love with him when she actually only has a crush on him, and the development of it was weak. In addition, I was disappointed to find that the horror I had come to associate with L.J. Smith from her Forbidden Game Trilogy was completely missing from this series! In basic terms, I was sorely disappointed. Yet, this novel had one redeeming quality: Gabriel. In Gabriel I was able to find not only the ever-so-common tortured male protagonist, but I was also able to find depth. Gabriel’s past makes him a complicated character and his interactions with the other characters were interesting and different. In fact, throughout the novel, Gabriel was the only character who seemed to undergo any type of change. 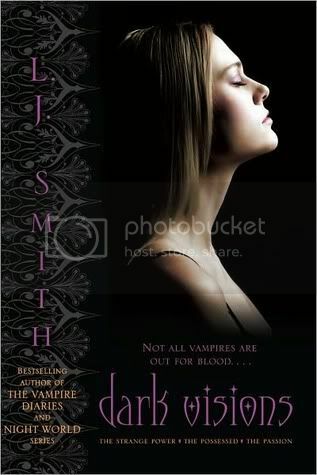 I had always loved how Smith made it a point to show how the experiences of her characters changed them, but I found that to be lacking in everyone except Gabriel in this book. I am definitely looking forward to learning more about him and uncovering his inner secrets. Dark Visions was, by no means, a bad book. It was interesting; it had witty dialogue, and was a lot more humorous than The Forbidden Game. Furthermore, it contained an interesting plot-line that was extremely unique and which I find myself to be rather curious about. Yet, in a novel with a primarily character-driven plot, the cast of Dark Visions was sadly lacking. Nevertheless, I am eager to see how this unfolds in the sequels and can only hope that this series continues to improve. If nothing else, Dark Visions has taught me that L.J. Smith truly is human and even the best of writers can have disappointing stories.